Not sure of the correct name. 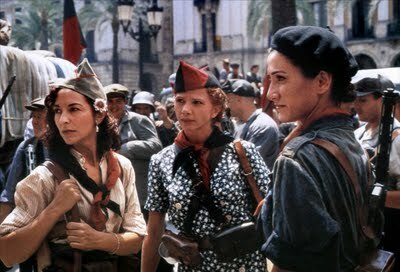 I need a good picture of the caps worn by Anarchist troops in Spanish Civil War. They were red and black. I can find small pics, of gaming figures, or from movies, but not a large enough example to paint my own figures. Bob, Do you mean the Isabelino Cap? I mean the hat on woman in the center Doing Google search on Isabelino Cap I find lots of examples of the correct shape, but not color. Thanks for the correct name, for SCW. No tassle. Bob, I think that is just an Anarchist color variant. I think, Nick, it is an anarchist variant , that's what I'm looking for. Lluis, do you have a side view. anarchist uniformity is so vital. The SC State Hat Museum approves these lids. Valerik, I did not know that. All of my figures are in different clothing, not really uniform, will that be al right? All of my figures are in different clothing, not really uniform, will that be all right? Do you have a choice in this Bobgnar? You did say they ARE women right? I've known fisticuffs to ensue when two gals wear the same shoes, much less an entire outfit! Nope, no matter how unauthentic or anti-anarchic your ladies lack of uniformity might be, I think you'll need to grit your teeth & live with the result, Sergeant Major's disapproving eye notwithstanding. Those nifty forage caps should tie them together nicely. And the flag. Can't really rally your anarchists without giving them all something to follow right? I've always been surprised just how much organization, discipline, & structure a proper anarchist regiment demands. I eagerly await pictures of these lovely ladies, out of uniform though they be. Please don't let the lace liars & button counters spoil any of the fun provided by your admittedly diverse distaff anarchist unit. Re: the British anarchist federation, i realize im 4 years late to the party but are there any sources on their participation in the scw? Im no expert but what I've read indicates the federation formed later, and at the time anarchist orgs in Britian had socialist-sounding names because they were recent split-offs of socialist groups. Anyone have more or better info? Im wondering because id love to use the beautiful but mysterious black and red Batalon Britania flag I got from minairons, but have only read about units of that name fighting with the International Brigades. After that, the Republican government became increasingly centralized (and pro-Moscow in its orientation). I would guess that many British anarchists became disillusioned with the Republican cause after those events. Those that didn't would likely have funneled their assistance through normal channels to the British International brigades and similar. Bottom line is, there was only "British Battalion" in Spain and that was part of the 15th International Brigade under Communist Party control. Anarchism just didn't have the mass base in Britain that it had in places like Spain and Italy although there has long been a community in Whitechapel, east London, centred around the Freedom Press bookshop/printworks that has been going since 1886. Yes I've been trying for over a month to join benno's mostly to reply to that thread. I gave up and revived this one instead. @ Durruti I'd love to check out some of the anarchists you may have assembled and painted, im just starting out in the hobby and looking for inspiration, if you're willing to share your work. Same goes for the rest of ya! I started a thread in "figure finder" category this summer about anarchist uprisings if folks want a more relevant place to post them. I hope to share my first models there in a month or so! Thanks as always for the info and replies. Lastly, on the subject of U.K. anarchists and the Spanish Civil War, anyone ever check out Stuart christy's amazing film archive? I'll dig up a link if there's interest. ,,,Lastly, on the subject of U.K. anarchists and the Spanish Civil War, anyone ever check out Stuart christy's amazing film archive? I'll dig up a link if there's interest. Yep, lots of interesting stuff on the SCW for gaming reference. First managed to find Vicente Aranda's works: "Libertarias" -1996 and TV series "Los Jinetes del Alba" (Riders of the Dawn) -1990 on there years ago.